The search giant eclipsed the iPhone maker last week, actually. Few would have noticed because the metric by which Google jumped ahead isn’t the widely-watched one of market capitalization. Here Apple is still well ahead, with a market cap of $378 billion versus Google’s $286 billion. But the market caps of both companies are swelled by their huge bank accounts. Strip out Apple’s $145 billion of net cash as of March, and Google’s $45 billion. This leaves an enterprise value of $233 billion for Apple, but $241 billion for Google, reflecting the underlying value of the companies’ actual operations. Look at the graph. 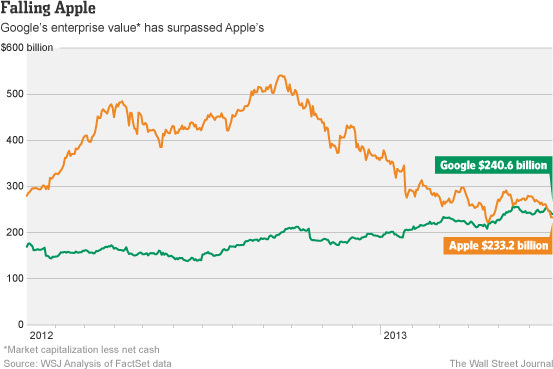 It’s not how much Google’s stock has risen, it’s how much Apple’s stock has fallen.